Last year in June, the American media was flooded with political commentary of the Supreme Court upholding a federal law that makes it illegal to give “material support” to foreign terrorist organizations. As the nation debated free speech verses national security, two Americans on their way to Somalia with intentions to join the Islamic extremist group Al Shabab, which aims to kill American troops, were arrested at the Kennedy International Airport in New York. New Yorkers, fearing for their safety, shook several weeks later when major news networks dropped a meteorite headline: “Ground Zero Mosque,” a proposed Muslim community center with a prayer space that morphed into a controversy about September 11th. Many residents were confused by its mission with some neighbors outraged by its close proximity to the site of the terrorist attacks that destroyed the World Trade Center and families of the victims. By August, more than 20,000 people signed an online petition against the project, and unsuccessfully lobbied the NYC Landmarks Preservation Commission to give the location landmark status, which would have delayed construction. The Commission signaled a green light for the project in a unanimous vote and Mayor Bloomberg celebrated the occasion with a speech on Governor’s Island, with Manhattan’s towering skyscrapers in the backdrop. “Let us not forget that Muslims were among those murdered on 9/11 and that our Muslim neighbors grieved with us as New Yorkers and as Americans. We would betray our values—and play into our enemies’ hands—if we were to treat Muslims differently than anyone else,” the Jewish billionaire told his suspicious audience. He praised religious tolerance over tears and shortly after his speech, an army of several thousand Facebook users showed their support, with a quarter million more defending their opposition. Officially called, “Park51,” the Sufi Muslim community center is a charitable organization with no political agenda. The Islamic institution is exempt from taxes, holds its own fundraising initiatives and under New York Law, submits an annual financial report to the Attorney General. It holds a postal address of 45-51 Park Place, two blocks north of the World Trade Center Site, in a neighborhood filled with convenient shops and mom-and-pop restaurants. Pedestrians around Ground Zero can’t see the thirteen floors of glass, concrete and steel, complete with an Islamic “prayer room” that fills two floors, of what used to be retailer Burlington Coat Factory. Two female Muslim receptionists on the ground floor collect fees for the spacious exhibition hall and donations from attendants for expansion efforts. A Caucasian security guard looks on, and guards the desk when the two women excuse themselves to join up to eight hundred Muslims for prayer. The rest of the building is under construction. Real estate developer Sharif El-Gamal leased 47-51 Park Place from Con Edison, the utility provider that owns half the space. El-Gamal serves as CEO and Chairman of Soho Properties, which built the institution modeled after the Jewish Community Center on Manhattan’s Upper West Side, where he lives. 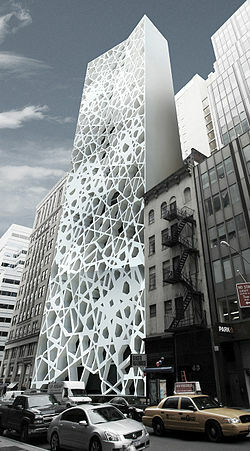 The New York native originally planned to build luxury condominiums, but was convinced by the Imam’s idea for a community center and prayer hall that could serve thousands of Muslims working and living in the financial district. Both men managed the property and oversaw its daily operations, until Imam Feisal’s replacement earlier this year. El-Gamal takes a business and pragmatic approach on Park51, remarking, “I can’t say this often enough. 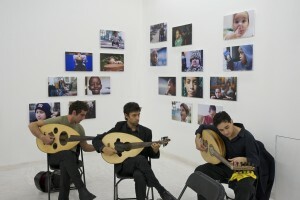 We work in Lower Manhattan, we care about Lower Manhattan and we’re here to provide services to Lower Manhattan.” And on its grand opening this year, in September, he gave his support in front of an enthusiastic crowd that gathered to listen to an orchestra playing Middle Eastern instruments. Photographer Danny Goldfield, from Brooklyn became Park51’s first exhibitor. He displayed a wall photo exhibit of New York children of different ethnicities. The Jewish artist was inspired by the story of Rana Sodhi, a Sikh who emigrated from India and settled in Arizona. His brother was killed in a retaliatory hate crime days after 9/11. Goldfield was pleased with community participation and openness towards his exhibition. Luckily, no one threatened a bomb, dropped an unattended package, or provoked police into interrupting the event. El-Gamal regrets excluding relatives of 9/11 victims, first responders and others, from the project. In an interview for the Associated Press on opening day, he told reporters: “We didn’t understand that we had a responsibility to discuss our private project with family members that lost loved ones,” and they didn’t “really connect” with community leaders. The mistake cost him his partnership with the Iman, who later told The Huffington Post of their visionary differences of incorporating the community. From design to execution, nationwide controversy surrounded the project. Polls showed that the majority of Americans, New York State residents, and New York City residents opposed the project. But a Fox News national poll taken August 10–11, 2010 found that 61 percent felt that the project developers had a right to build it a majority of Democrats (63–32 percent), Republicans (57–36 percent), and Independents (69–29 percent). The Economist/YouGov poll taken a week later noted that 52 percent of Americans believed Muslims should be able to build a mosque in the country, as other religious groups have the right to build their own houses of worship. Counterterrorism analysts responded to the controversy by calling Park51 a “recruitment opportunity” for radical Islamist groups. Newsweek interviewed a Taliban member who drew parallels of the opposition to increased support Taliban causes, thrilled by the American favor. By the grand opening, national discussions about Islam had become so fragmented, controversial and polarized that Congressmen worried about homeland security. The Counter Intelligence Agency (CIA), equipped with the Patriot Act which gives law enforcement agencies permission to search phone, email, medical, financial, and other records, continued targeting homegrown extremist groups as hate crimes against Muslims intensified. 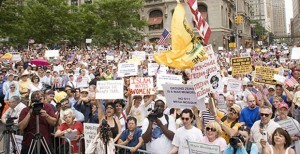 The Republican Party and its Anti-Islam campaigns fueled most of the opposition. 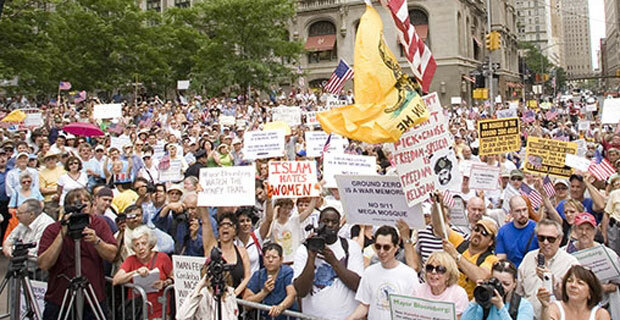 Former Presidential Campaigner Sarah Palin famously tweeted, “Peaceful New Yorkers, pls refute the Ground Zero mosque plan if you believe catastrophic pain caused @Twin Towers site is too raw, too real.” Palin supporters expressed concern for Islamic triumphalism that would eventually destroy our civilization. New York Republicans, former Governor George Pataki and former Mayor Rudy Guiliani, expressed their disapproval; Guliani couldn’t imagine a mosque erected at Pearl Harbor. Muslims shared criticism. Ahmadiyya Muslim Community argued that Ground Zero doesn’t suit mosques, and its Head Mirza Masroor Ahmad stated, “If a mosque is built at the proposed site, then the Ahmadiyya Muslim Community would like to see churches, synagogues, Hindu places of worship and places of worship of all other religions also built near Ground Zero,” as quoted in Wikipedia. Muslim Neoconservative journalist Stephen Schwartz opposed Imam Feisal’s activities he called “radical,” claiming they were inconsistent with the Sufi philosophy. A Muslim professional group in the Phoenix Valley of Arizona protested its location, whereupon America declared war on its Muslim citizens. Some Muslim Canadian Congress members, university scholars and relatives of 9/11 victims shared similar sentiment, campaigning against its offensive and insensible prospects. The diverse spectrum of resistance hasn’t deterred Park51 from educating the public about Islam and its culture, from erecting its state-of-the-art recreational facilities for the religious and non-religious, whom will enjoy playing basketball, swimming, reading, dining, cooking and attending performances. El-Gamal’s company plans to build classrooms for Arabic and English language instruction, and office space for servicing domestic violence victims, immigrants, senior citizens, and the homeless. The long overdue memorial and quiet reflection room will commemorate the victims of the September 11 attacks.